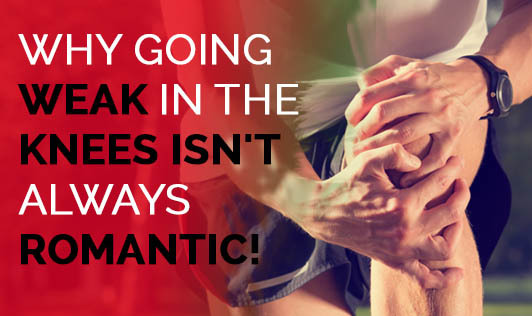 Why going weak in the knees isn't always romantic! Does the thought of exercising make your knees go weak? Not only does inactivity decrease joint motion and flexibility, it also leads to weak muscles and deformed joints. Stiff joints can be reversed with regular exercise, muscle building, and boosting overall fitness. All this especially holds good for people with Rheumatoid Arthritis (RA). Just remember to consult your doctor before starting an exercise regime. Choose low impact exercises like stair climbing, walking, dancing, and low-impact cardio machines as it builds endurance, strengthens bones and leg muscles. Start with a few minutes each day gradually increasing the duration. Include resistance exercise twice or thrice a week like elastic bands, free weights, or machines to improve muscle strength, mobility and decrease joint pain. Stronger muscles decrease joint pain as it supports the joints. Swimming is a great exercise to condition all your joints and strengthen your back as it doesn't put excess stress on your joints. Tensing the muscle without visible movement often referred to as Isometrics helps build muscle. Isometric chest press and shoulder extension are also effective in strengthening overall body joints. Thigh exercises are considered essential as thigh muscles are the major support for the knees. Increase flexibility and restore joint motion by stretching. Moist bath or warm baths help ease pain and stiffness before and after stretching. Keep your other joints like fingers, elbows, wrists, hips and feet flexible by stretching and rotating. Avoid high impact exercises like running, jogging or playing tennis or hard pavement as they put excess stress on joints and is not recommended for RA. Too much or too less is bad. Balance rest with exercise. Fatigue is common with RA. Talk to your doctor to know the intensity and duration of workouts for you. Personalize your exercise regimen by having a personal trainer to avoid injuries. People with RA are more prone to heart diseases. So exercise to keep your heart healthy. Remember! Healthy heart-healthy joints-healthy you!